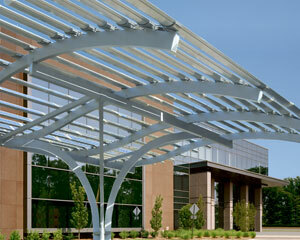 Utilizing structural aluminum tubes, this curved entry canopy is only six inches deep. Curvature can eliminate the need for three dimensional framing, as shown here. It is fifty feet wide and thirty feet deep and the design can support the required 160 PSF snow load. Aluminum can also be used in smaller span structures, as it allows for cantilevers and extensions of the material that would not be possible with a heavier structure. skylights can be designed using a single layer aluminum tubes without the need for steel sub-frames. 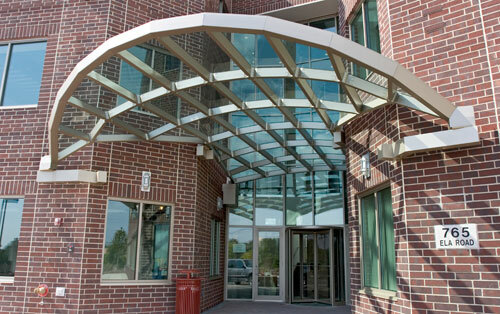 Utilizing structural aluminum tubes, this curved entry canopy in Eau Claire, Wisconsin is only six inches deep. It is fifty feet wide and thirty feet deep and the design can support the required 160 PSF snow load. These large botanical spaces designed by Emilio Ambasz are clad with large glass panels connected directly to the structural members by use of an aluminum purlin system. The design of a space frame and its components includes the connectors or nodes that are used to join members and designed to carry loads. These connectors can be shaped to fit almost any profile. For example, a linear node system will allow the space frame to have a very flat structure that can be used both in an overhead or vertical wall system. Custom extrusions with rigid joints, tubular members and small node connectors can also allow glass to be flush mounted. Design professionals should consult aluminum fabricators at initial design phases. Fabricators can propose a variety of structural configurations and analyze the most efficient connections and structural forms to achieve the best sustainable design solution. Aluminum structural systems are designed to support any cladding system available in the market. 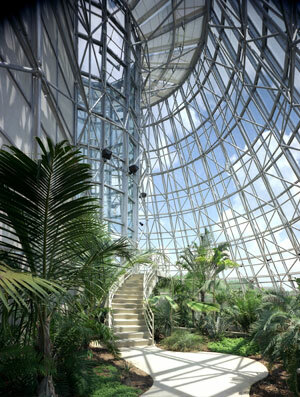 As seen in the large botanical spaces designed by Emilio Ambasz (The Lucille Halsell Conservatory at the San Antonio Botanical Gardens), spaceframes can be clad with large glass panels connected directly to the structural members by use of an aluminum purlin system. This structure encloses an environment which is high in humidity. The plants are misted daily. The advantage of the aluminum frame is that it will not corrode and maintains its appearance. Aluminum can also be clad in translucent panels or engineered to receive tension fabrics. Aluminum structures are the clear choice for designers engineering solar panels to clad roofs, walls and freestanding solar systems. Photo courtesy of WATTLOTS, Inc.
Organic long solar beams carry curved solar panels that track the sun in this aluminum Power Arbor at a corporate campus by WATTLOTS, Inc. When architect William Kaufman, AIA, president of WATTLOTS Inc. describes his new product, he talks about biomimetric inspirations. These solar “trees” can be planted in parking lots as arbors to reduce heat island effect while collecting solar power to be added to the grid. His design is “an exercise in biomimicry, the structures perform intellectually like trees, the light is not fully blocked and rainwater is collected at their bases. They are like a trellis growing from a root system.” These long, thin, solar beams track the sun and were designed to meet strict aesthetic requirements. These new solar carports take advantage of the unused real estate in parking lots, providing new uses and other sources of parking lot revenue. They are not only solar and collectors, but also vehicle recharge stations. In addition, they can be used for advertising and part of a communication system. Kaufman chose aluminum as his design material because it provided him with many sustainable features. He was able to integrate into a lightweight extruded aluminum frame a panel that holds the solar cells as well as integrate the micro-inverter and wiring into a chamber for electronic equipment. These modules are designed as eighteen feet long beams placed parallel to one another in segments. The strength of aluminum allowed all of the loads to be carried to one central base where a mechanism drives the rotation of the beams toward the sun. Using aluminum allowed for a high level of recycled content. Corrosion resistant, the aluminum frames are durable. The flexibility of aluminum and its extrudability allowed the designer to create the organic forms desired. The connections make the system easy to assemble and disassemble and at the end of its life will be able to be recycled and repurposed into a new use without a loss of strength from the original material. In addition to the solar carports, Kaufman also has designed a solar wall system that also uses the advantages of aluminum as a material. The solar wall system is an identical product without the tracking system. The long thin one-foot, slightly curved panels are placed on the South-facing facade and are fully integrated into the building envelope. They act as shading fins and are tilted to the appropriate site solar aspect. They shed snow and water from one to the other, and act as fins or solar shingles across the building. These solar panels provide new opportunities for the facades of numerous windowless environments: parking garages, warehouses and big box stores. The aluminum extrusions are lightweight, carry the appropriate loads and create a productive use for otherwise lost building area. Solar shingles are added to this building in this WATTwalls warehouse application concept image. Panels will generate power that can be used by the building or sent back to the electrical grid.